Cassoulet was probably the first French dishes that really hooked me on French cuisine. I was working at Chez Panisse at the time and when the new Zinfandel wine was released, in a style similar to the annual release of Beaujolais nouveau in France, or the garlic festival on Bastille Day (called 14 juillet, in France – if you called it “Bastille Day,” no one would know what you were talking about), the cooks would often make cassoulet. Because I was working and making dessert, I didn’t have time to actually sit down and eat any – because customers don’t really want to hear that their dessert is being held up because the pastry person is sitting down having dinner – I did get to take a spoon and scrape off, and eat, all the crusty, meaty, chewy bits that were stuck to the rims of the pans. Which, of course, are the best parts. And if you’re going to make it, you make it in quantity, as it’s not a dish you’ll find in one of those “Cooking for One” or “Dinner in 5!” cookbooks. You need to gather the meats, fry up the sausages, prepare the beans, and cook the whole thing for several hours. There aren’t too many shortcuts in making cassoulet, save for having the duck confit already made, which is available pretty easily in France. But pork and beans, which one might say is the American cousin of cassoulet (although other cultures have their own versions or meat and beans, too, including fabada from Spain), is an express version of the iconic French dish. One thing that’s pretty important to either dish is the couenne, the thick layer of pork rind that gives the liquid a velvety juiciness. 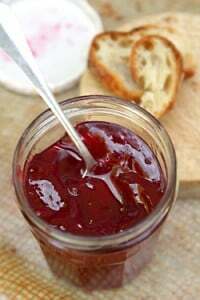 It also does the jell-thing to liquids when cool, that skeevs out some Americans, but delights French people. Working on a hunch, I thought that Pistachio Aillade might be a nice condiment to go along with the beans I was cooking up. Years ago I was at Au Trou Gascon a highly regarded Gascon restaurant in Paris, and they presented us with a “summer cassoulet,” which come out with a swirl of basil puree streaked over the top. I am sure that many members of the authenticity police would be in a tizzy about that one, but it worked really well at lightening up a rather substantial dish. But food evolves and I’m not sure die-hard traditionalists would be all that happy to be stuck eating things that people ate a few hundred years ago, or forgoing refrigeration, which one could perhaps argue added a “special flavor” (ie: rank) to certain foods. In the here and now, I’m content to be able to cook up a pot of pork and beans every so often. I do like to use good-quality dried beans, and I add ham hocks, called jarret de porc or jambonneau (which are sometimes deboned and molded), in France, to the cooking liquid, whose skin imparts that silky quality to the cooking liquid. We get the hocks either fresh, salted, or smoked. The ones I got are already cooked, but no matter; they still benefit from being poached longer in the bean liquid, while at the same time, flavoring the beans. 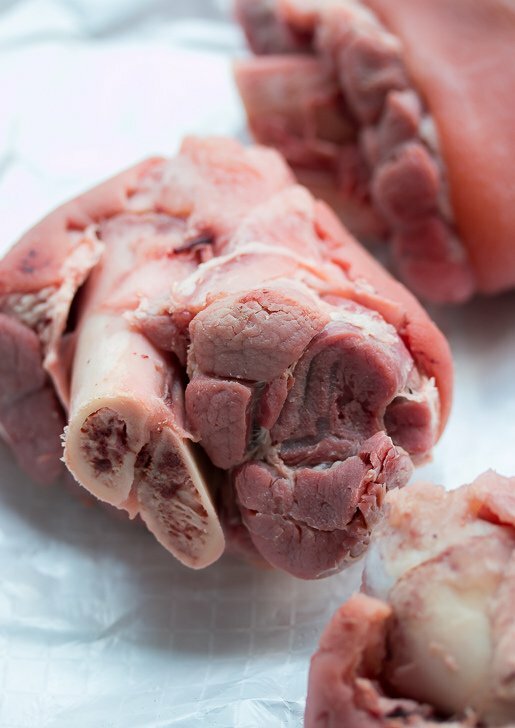 Ham hocks are available at butcher shops and well-stocked grocers. You can either use fresh or smoked. Just a note that in the United States, some are heavily smoked, and their flavor can obliterate the delicate flavor of the white beans. So depending on your preference, use what you like. Because the pre-cooked and smoked hocks are salted, you might not need to add much salt to the dish. If you can’t get ham hocks, a big slab of pork belly works well.For faster cooking, soak the beans overnight in a Dutch oven, a very large casserole, or stockpot, covered with cold water. I use about double the amount of water, per volume of beans, for soaking. Because beans vary, you’ll need to watch the beans and pork as they’re cooking, and add more water if necessary. One nice addition to this dish is a few generous handfuls (about 2 cups) of chopped greens, such as kale, Swiss chard, or mustard greens, added during the last ten minutes of cooking. 1. Soak the beans overnight in cold water. (See headnote.) The next day, add the bay leaf and thyme to the soaked beans in the pot along with 8 cups (2l) of water. 2. Bring the beans to a boil. When the water begins to boil, add the diced carrots and onions, garlic, and ham hocks. Let the beans come to a boil again. 3. Once they’ve come to a boil reduce the heat so the beans are cooking at a lively simmer and let cook until the beans are tender, adding about 3/4 teaspoon of salt to the beans when they start to soften, about three-quarters of the way into cooking. My beans usually take about 2 hours to cook, but they can take less time or more. (Figure 1 to 3 hours.) While they’re cooking, make sure the beans and ham hocks are covered with water. Add more, if necessary. Serving: Remove the hocks from the beans and set them on a plate. When cool enough to handle, shred the meat from the bones, discarding the bones and skin, and add the pieces of pork back to the beans. 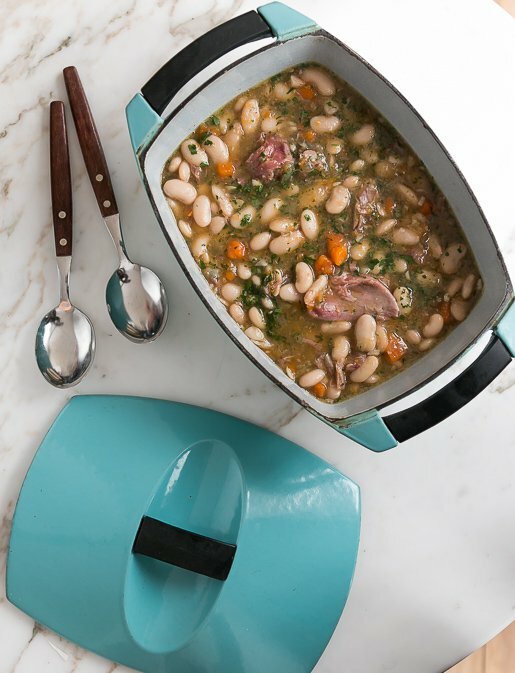 Rewarm the pork and beans together, then ladle into serving bowls. Top with aillade, pesto, or chopped parsley, if desired. Storage: The pork and beans can be refrigerated for up to four days. Rewarm on the stovetop, adding more water and salt, if necessary. David, do you cook the beans in the soaking liquid, or do you use fresh water? I use the soaking liquid, then add more water when cooking the bean, hocks, and vegetables. Steve Sando (bean expert at Rancho Gordo) uses it too. (Linked at the end of the post.) Some used to say to drain the beans and use fresh water, but he says there is no difference and uses the water. So I do, too. Inexpensive raw ham hocks used to be everywhere in my corner of Spain but as of late they’ve become scarce. I’m no conspiracy theorist but I have a feeling that this bit of pig is being smoked and shipped for export just like hipsters and their fixie bikes are driving up the price of old frames. But I have come to praise your recipe, not to boast about how I was cooking with “codillo” before ham hocks were cool. I like the part about adding the fresh greens at the end which I also saw somewhere in a risotto recipe. I love that kind of recipes. I laughed out loud at the phrase “skeevs out.” Google translate detects it as Afrikaans. It is a perfect word though, and I am guessing that hee -bee-jee-bees would be no more clear to your non-native English speaking audience. Ah, this was a staple in our house, growing up in the Deep South USA in the 1950s. Seems it’s gotten harder to get fresh ham hocks now. Oh, you can get them, it just seems like the majority are smoked. And you’re right that they’re heavily smoked and it does alter the flavor of the beans. Just got a BIG cold snap here in TX so this is going to be the meal for this evening. Thanks! I’ve noticed in that in the U.S., diverse cuts of meat are often available in Asian and Hispanic markets. Since things like ham hocks probably aren’t as popular as, say, boneless chicken breasts, they’re likely smoked so that they keep longer. In Paris, they are often brined in a salt solution, for flavor and preservation. Stay warm in Texas! Most stews are better the day after. It really is quite a significant differentce. I try to plan my cooking accordingly, but that does involve planning ahead and that’s not my strong suit, but well worth both the effort and the waiting. Applies to anything from italian ragu to Bœuf Bourguignon to any other stew. I recently made the cassoulet recipe from your book and it is wonderful. This recipe looks spot-on for January eating, thanks for the inspiration! 1) what type of beans are those beautiful white ones pictured on your blog? 2) For those unfamiliar, ‘ Skeev’ in my upbringing (northern US Italian American) is a slang that comes from the Italian word ‘schifoso’ which means revolting, gross, etc. Those are “Cassoulet beans” from Rancho Gordo (I linked to them at the end of the post) – they are the same Tarbais beans that are grown and sold in France, but are more available (and reasonable). They’re excellent and highly recommended. Skeev actually is a word (feisty moth*rf*”ker). I also loved the phrase. I’ve found ham hocks in the US to be too smokey/salty. Since the beans are soaking overnight anyway, I make a “ham hock broth” by poaching the hocks in water/carrot/celery/onion until the meat and bones start to loosen up. It’s also a good idea to ask the butcher to saw the hocks into thirds. The hocks break down easily into meaty nuggets, and I discard the bones, skin, and gristly bits. The strained, chilled broth is easily de-fatted, and most of it goes to cook the beans, adding the meat when the beans are finished, with the same gelatinous, silky result. Trust me, I have no fear of fat, but I’m also not working in a field somewhere. …and, I will find ways to insert “schifoso” into my conversations. Sounds really yummy, and I adore that casserole dish! Cold here in Toronto too. I will get my local butcher to save me some fresh hocks. “Pork and beans” as I understand it (as opposed to cassoulet) — the American dish — usually includes molasses and mustard, maybe even tomato. Think “baked beans,” which usually have pork added, either bacon or salt pork. I also absolutely adore your casserole dish! Could you tell us what brand it is and where it came from? I find that ham shanks are meatier and less fatty than hocks (but with enough fat to give texture and flavor) in my pea and ham soup. They might work well in this recipe. But I agree on the over-smoked/salted versions available in America. People here like to assault their taste buds, not beguile them as in France. I tried the “Cassoulet kit” from d’Artagnan for Christmas this year: delicious flavor, but it cooked up too thick and the meat and beans broke down too much. Maybe it was my fault and I cooked it for too long, but I did follow their recipe–I’ll try yours next time! Btw, I was given “My Paris Kitchen” for Xmas and am loving it. Thank you! You mentioned Le Trou Gascon: I’m always surprised to see Parisian restaurants making such a hearty dish in warm(-ish) weather, so their attempt to summer it up is impressive! Thanks for the recipe. Any suggestions on how to make this without meat? My husband and I have been pescatarians for about 6 months now. we just don’t trust the US meat industry and their lack of standards/humane treatment of animals. Hi Linda, I have the same question for the very same reason. I thought about trying this with either: stove top smoked mushrooms, soy granules or field roast sausages. It will probably not be the same or even similar but may be satisfying enough… More ideas are always welcome! I bought ONCE a large cassoulet in a glass jar here; it was so utterly awful that I had to throw it out – since then I’m back to making my own, in large quantities for the much loved heat-up. I do, however, abstain from too fatty meats, I am a rather lazy bum, not doing much sport and simply don’t need the extra calories – it still tastes amazing. I usually take something like pallet or another not too ‘heavy’ piece of porc. And to all those who can’t believe in the ‘summer cassoulet’, we went to the Trou Gascon last summer with friends from abroad and one well and truly ordered the cassoulet and ate it with great relish! We other guests nearly died…. Thank you for this timely January TROU meal, cheap, cheerful, wonderful taste and cooked once, eaten at least twice or even with extra much cooked, three times!!!! I think I must be a cassoulet hater because I have had cassoulet countless times and have made it several times too, but I just don’t get what all the fuss is about, its just basically beans, meat, and fat and I find the result rather insipid. I’m still trying to figure out all the hoopla over it, perhaps its the french provenance but if anyone can do right by it, you can. Still, I’d much rather eat homemade baked beans in winter, made with dijon mustard, molasses and good thick bacon a la Julia Child. Superb! This is a classic recipe of the American West. Since Idaho/Washington are bean-growing states we have a large variety available. I’ve used them all in this type of recipe but I especially like Cannellini beans which are white Italian kidney beans. For people that have gastric upsets after eating beans it is recommended to discard the soaking water, using fresh water for the recipe. Also adding a chopped green, I use swiss chard, is a good idea to add nutrition and color to the dish. We also use a tomato-based salsa, fresh or canned, for a finishing touch. Be aware that salt or an acid based product slows the tenderizing of the beans. 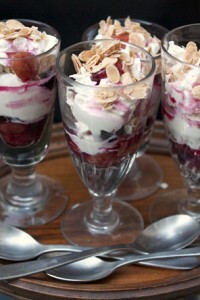 Great recipe and one I enjoyed seeing. Thanks David for the post. Jules: It’s a vintage Le Creuset, designed by Raymond Loewy. I picked it up at a flea market in Paris. They’ve just resissued them (for a price!) and are available at the Williams-Sonoma and Le Creuset websites. Thanks for the tip on the smoked salt! And yes, we are using mushrooms in a lot of dishes that call for meat, as they add a richness and earthiness to food. I LOVE to cook, so this has opened up a whole new world of challenges for me. Having been raised in the south,we ate meat with every meal, so it’s been an adventure. Linda, David, I have a small stove top smoker and it works great. I smoked lots of mushrooms, eggplants, tomatoes etc, all were good. If you get the one from Amazon, make sure that you tighten the lip a bit with a tool, this way it keeps most of the smoke in the smoker and no one will even notice the smell. Thanks for this recipe, David. I love cassoulet (like you, I was hooked the first time I tasted it in France), but making it is so time-consuming that I usually pull it together only once a year. So happy to have this easier recipe that I’m sure will provide just as much enjoyment. Fortunately, we have a fantastic butcher in town that sells ready-made confit de canard, so I think I might add that as well. I make ham and bean soup for my husband’s store one day a month and it is very popular. I have made a couple of changes that seem to increase the flavor even more. After soaking the beans, I discard 1/3 to 1/2 of the water and add in an equal amount of homemade chicken stock. I also substitute shallots for the onions. I have also been known to skip the soaking part and just cook it all day in a slow cooker on low with equally good results (using great white northern beans or navy beans). The salesmen love to smell the soup cooking all day and there are never any leftovers. Love you, love your blog but I am having a hard time with the emails you have been sending out. My inbox is already jammed so I would like to unsubscribe from the daily/blog update posts as I prefer to come to the blog itself. Unfortunately, there is no mechanism to do so. The only option is to block you but then I probably won’t get the monthly which I want to keep. Sorry to have to address this in the column but there doesn’t seem to be any other way to reach you. Can you help? Hi DP: Oops! Sorry you were getting the the extra emails. When I merged my newsletter and blog subscriber service, there was some overlap and the service was having trouble separating them out. There should be an unsubscribe link at the bottom of the messages to easily unsubscribe, but I had them remove you. They said you weren’t in the newsletter subscriber base, so if you’d like to subscribe to that, you can follow the link here. Thanks! Coccido is Cassoulet’s country cousin. It’s from Basque country, a stone’s throw from France. It’s far less fussy, more dependent on what you have about on a working farm. A pot boils on your wood stove all the time and into that you toss bones, vegetable parings, onion skins, whatever. After a few days you drain off the broth, return it to the stove and toss in sectioned lamb, some sort of smoked pig, and disjointed poultry. You add dried beans (garbanzos are traditional), vegetables including cabbage, herbs. This is farmer food — rich, flavorful, lacking in pretense. Very yummy. For awhile I grew pretty much everything I ate, and this was popular. Hmmmm. Very different from the “famed” cassoulet. Certainly worth making. 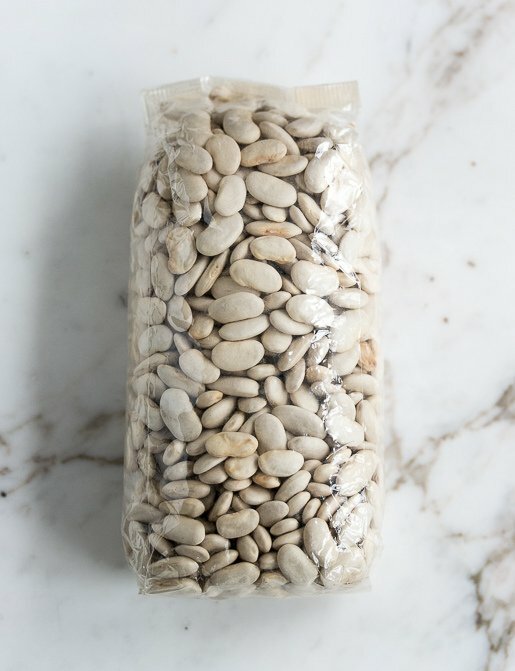 What white bean from Rancho Gordo do you use? May be the version I loved at the NYC restaurant, Le Veau D’Or” that always had it on the menu in the 70s and 80s when Gerard ran it. Wonder if there is a hybrid that incorporates some other components of the “famed” version. 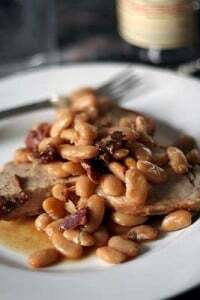 Try black-eyed peas for cassoulet with Toulouse (pork) sausages and duck confit. I live in Detroit, Mich. Smoked ham hocks are all over the place. In the city, they start at about $1.29/lb. But in the suburbs, they’re considered a bit of a “delicacy” and cost $3.99/lb! I did find “fresh”/frozen ham hocks at the Eastern market for about $1.59/lb. The counter guy said they’ve been selling them in bulk to some of the new “hipster” restaurants that do in-house smoking. And yes, that “gelatin” from a cooked down rind is an acquired taste but I love it! I believe all stews and curry type dishes should be in the fridge from 1 to 4 days before eating. This has now been scientifically proven to break down enzymes and provide a different and better taste. Making a large amount and eating it over 4 days is also cost effective and taste instructive. Reheating on a stove top to me has not proven to be as effective as being in a Bain Marie or in a pot over boiling water. The taste seems duller when using the oven top. Right up my alley…looks so good. Country cooking in the wintertime, you can’t go wrong. I’m in Fontainebleau (une Nouvelle Angleterre expat aussi) and flaberghasted by the lack of smoked meats in the supermarchés –would a boucherie be a better bet? I’ve been seriously considering one of those stove-top smokers because I have missed the smoky flavor, and have plenty of Hêtre here! Sorry homie, that aint pork n beans. Don’t forget your American roots. That picture should have a bottle of Grandma’s molasses right next to it. Still like you anyways. Odd. Neither traditional pork and beans and not cassoulet. Only you could get away with it. Also odd to use the soaking water. Draining it seems to eliminate the resulting gassy effects. Also surprised and never heard that cassoulet is eaten on 14 juillet as it’s a very winter-y dish and much to heavy for summer fare. Burp. Hi David! Perfect timing for wintry food. It is going to be below zero here in western Massachusetts all week. I have some ham hocks in the freezer that I bought at a farmer’s market. Now I know what I am going to do with them. Thanks! Love the new cookbook. Got it as a Christmas gift. Thanks for what you do. While I love the authentic versions of some dishes, cassoulet is not one of them (with the exception of bacon I’m not a huge fan of pork). So my cassoulet forgoes the ham hocks, but I did find a really tasty duck sausage to throw in the pot. Try making a cassoulet with black-eyed peas. Delicious. I’m living in Israel, where Ham hock isn’t available, what good substitute can you recommend for this dish? Will Pork chops do the trick? Love your site and recipes. A few years ago, early June…..Arrived in France, Toulouse. Major jet lag, up before dawn and reading the tourist publications in the hotel room. Recipe for cassoulet with fresh broad beans – oh yes! Perfect for our villa rental. Down one block to the wonderful Toulouse market with the ingredients list and my dodgy French – what on earth were couennes? The stall holders twigged to what I was planning to cook, all pitched in with great ingredients and advice. Result? The next night, a great spring cassoulet at our rental. David, thanks for reminding me of a wonderful French experience, and as ever for your great blog. Will check the source of the recipe – famous Toulouse restaurant – and pop it into another comment, tomorrow Aussie time. stuart: The beans I use are listed at the end of the post, with the links. They’re great, although people can use whatever bean in available. However after much testing, including supermarket beans versus “heirloom” beans, I do find a huge difference and much prefer the heirloom beans. Also there are lots of versions of cassoulet – some say the word “cassoulet” also means “argument”! – some have lamb, others don’t. Some use fresh fava beans, others use dried flageolets, while some insist on the Tarbais beans. phyllis: It’s not cassoulet, but I mentioned that dish because that’s also a “pork and beans-based” dish that I like. According to Steve Sando of Rancho Gordo beans, cooking the beans in the soaking water doesn’t affect their digestibility at all. But people are welcome to drain and rinse the beans if they wish. I made the chicken pie from your cookbook for a dinner party this weekend. I don’t like tarragon so I used fresh thyme. The six guests loved it. There were leftovers so 3 of us ate it for Sunday supper and I had it last night for dinner and there is still more. It’s going to end up supplying at least 12 meals. Being Southern, I made the biscuit version. The cookbook is no longer pristine which is the mark of a good cookbook – you can tell the recipes that have been used by the dirty pages. I noticed the comment from JoAnna that ham hocks are easily available in Detroit. I live in Toledo, 60 miles south of Detroit and they’re pretty common here, too. Both cities have transplanted southern populations that came to work in the auto factories. That could explain the availability of foods that are otherwise southern favorites. Easy to buy grits here, too. If you substitute red kidney beans for the white beans in your recipe, you have the first half of Red Beans and Rice. Slide a piece of grilled andouille next to it for a New Orleans favorite. But Louisiana andouille, not French andouille, which is a different sausage. The chill is in the air, time for stewpots and simmering meals. Can’t wait to try this one. The Cassoulet beans are sometimes available at my grocers, if not, I’ll go with the cannelli bean. They cook up quickly so I’ll be pot watching. Thanks David. I have a pot of beans on now — couldn’t find a ham hock or shank so had to settle for a “ham steak with the bone” and it was smoked — oh well, it will be good. thanks David! I loved the “skeev-out” line! I thought that this was only a word that we used in the Italian-American vocabulary as an americanized version of schifoso. Well at least that is the way remember it being used in South Philly. Didn’t know that it had reached far and wide. The recipe looks fabulous by the way! Hello David. Do you think it’s possible to make this recipe in a slow cooker? Actually, as any Italian-American in New York or Chicago can tell you, “skeev” comes from the Italian adjective schifoso which means dreadful, awful, etc. We use it all the time. ANDREA – I made a very similar recipe in my slow cooker this weekend. The ham bone and beans went in with bay leaves early in the day, and the vegetables went in around 30-60 minutes before we ate it. I put it on low for a total of 8 hours. It turned out great with a really rich broth. Good luck! This recipe with pepper should be a wonder! I made pork and beans for my Mom who was ill over Christmas. She hasn’t been hungry and I haven’t found anything she would eat until I made your soup — which she loved and asked for seconds. She said it was the best soup she had ever eaten and perfectly seasoned. Thanks so much David! wow what a natural food. Prayers for all Parisians – stay safe. This recipe is fun. It is quite similar to one from my Great GranMa’s recipes over one hundred years ago. The wonderful smells are filling the house right now. rain is over for a few days. fog has lifted…sky is clear and the sun lights and warms all. The prep tools are cleaned and put away before the pot has come to a boil! Dicing the carrots and onion were great morning therapy. This posting/recipe has brought peace to this cranky old soulless one………..
Pork and beans are a favorite winter dinner in our house! I was settling in to enjoy your latest food article when I was arrested by the photo of the carrots. They were delightful, appearing to have been just pulled from the soil, BUT they had been rudely scalped! Their graceful and delicious leafy greens had been crudely cut off and apparently thrown away. What an awful waste. Carrot leaves are wonderful in almost any dish containing carrots! Soups, stews, cassoulets, and more. Please try them in whatever you might add parsley to. 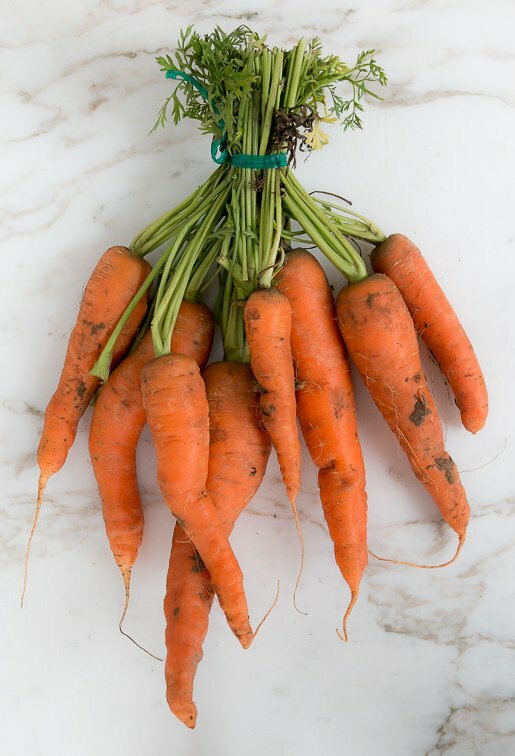 Carrot greens are delightful with their own distinctive herbal flavor. Actually, I noticed the carrots, too. They had been pulled from the ground recently, or made to look like so, but we are way out of carrot season in France. Perhaps, it was an earlier picture. Or, from somewhere else? Or, greenhouse grown? Curious….I’d say. Prayers for you David and all Parisians…. I received your wonderful, beautiful new cookbook yesterday. I immediately made the French lentil salad with goat cheese and walnuts. Oh my goodness, it was so good!!! In the book, you call it a “side”. We ate it with fresh bread and fruit and tried to think of some sort of meat, poultry or fish that would pair well with it and couldn’t really come up with anything. What do you suggest? Can’t wait to read all your stories and try more recipes. I have several of your cookbooks and love every one of them. Sounds devine. My favorite dish is at Giacomo’s in Houston, porchetta e fagioli, seasoned with fennel and rosemary. Lynette cooks like she is preparing for family! i have never had the pleasure of eating cassoulet. It sounds delectable! Just want to say I enjoy your work. Friend from Bay Area and I like your books. Best wishes and a happy new year from Seattle. PS, ate roast chicken and salad tonight; pate de campagne in the fridge for Sunday’s buffet party. Pig et frijoles always welcome at the table too; à bientôt and cheers. This dish is so indulgent- salty, creamy and comforting! I first tried it whilst staying in Carcassonne within the old city walls. Such an amazing place and meal, it will definitely be on my winter menu. Just curious David, did you cook this bean dish uncovered? Dave…………Made your beans in a crockpot….only thing missing all the crusty, meaty, chewy bits ……..Otherwise, fabulous !!! Thanks Dave.. In the absence of ham hocks, I took your suggestion of getting pork belly. Any advice? I am afraid if I put the whole 2lb peice in there the whole thing will get too fatty. Pork belly does have more fat so it may benefit from pre-cooking. Check out recipes and techniques from others, for some strategies: Baked Beans with Pork Belly and Quince (Food+Wine), Pork Belly and Beans (Nigel Slater), and Slow Cooked Pinto Beans with Pork Belly (The Garden of Eating). WHERE….did that great blue casserole pot in the top picture come from?!?!? I want one. Filled with beans and pork, of course! Thanks for the lovely recipe and happy new year! Would this freeze well? (I halved the recipe above and plan to share some with guests but there will still be leftovers…lots of leftovers). I’ve never tried to freeze a soup with beans (just broth) so wondering if anyone can give me guidance before I ruin it. I would also love to know where the beautiful blue dutch oven came from! It is gorgeous– as are the pork and beans! It’s vintage Le Creuset, designed by Raymond Loewy. They’ve recently reissued it, temporarily, and you can find it on their website or at Willams-Sonoma. Just made this. Very, very delicious! I’m sure it’s meant to cook uncovered – I had to sieve it and reduce the liquid heavily, because I always use a lid on the pot when simmering. It was my first time cooking with beans, but it will definitely not be my last! Typically I bring my beans to a simmer uncovered on the stove, then cover and place them in a 275 oven to cook till tender. But David’s Pork and Beans do look as if they cooked uncovered and reduced in the process. I’ll give it a try as soon as I procure the raw hocks. I cook beans uncovered because I like the liquid when it’s reduced and concentrated. I know that sometimes people like to use pressure cookers, but not sure if you get that some reduced, bean-y liquid with one. So I just use a pot. This was almost so delicious…our attempt was sabotaged by shockingly salty ham hocks (in spite of multiplying the beans and veg by 1.5 and buying slightly smaller hocks). We may try ham shanks next time. So, if you are in America and aren’t familiar with whatever hocks you end up getting, perhaps try using just one being with. Also, after reading this (http://www.latimes.com/food/dailydish/la-dd-dont-soak-dried-beans-20140911-story.html#page=1) in the LA Times, I did the same as Peter above and put my beans in a 250 degree oven after bringing everything to a simmer on the stovetop. They were done in right around 2 hours, without soaking the night before. Yes, American ham hocks can really be salty, or not. wow, that looks good. I might have to make that next week when we are expecting snow here in Basel. About a year ago I purchased part of a whole pig from a local farmer. I’ve been wondering what to do with the ham hocks. The soup is simmering now and smells absolutely amazing! Thanks for passing on the recipe! Both your pork & beans recipe & your cornbread recipes belie your non-southern U.S. roots (now thoroughly influenced by French cuisine). Proper southern cornbread doesn’t use sweeteners and are generally all cornmeal & no flour. My family’s roots are in Kentucky where the “pork & beans” are made very simply with pinto beans & smoked ham hocks and are served with unsweetened, dense cornbread baked in a pre-heated cast iron skillet for a crispy exterior. The “dessert” is another slice of cornbread slathered with butter & generously drizzled with SORGHUM (molasses from sorghum grain). To Ana Crouch — You can deal with the variability of the saltiness of smoked ham hocks in the U.S. by avoiding adding additional salt to the pot until the beans & hocks have cooked long enough for the beans to be nearly tender. Taste them at that point to see if any additional salt is needed. More often than not the salt level will be fine from the hocks alone & you won’t need more salt. I learned that from my Mother & Grandmother and it’s worked for me for all the decades of my life cooking. Thanks, David! Ham hocks will be on the grocery list tomorrow. I love beans and this recipe was delicious! My Girlfriend made it and was concerned that the mixture would not cook down like Guy’s did. But in the end, it did and it came out great! I am trying the cassoulet recipe (and naan and french fries) on my first foray into the book. Mine looks so dry after an hour. Do you add liquid during the 3 and a half hours cooking? Cover the casserole? Not sure. I’ve made that many times and there is quite a bit of liquid in there, which does absorb during the lengthy cooking. In step #9 it mentions that the beans should be barely floating in liquid. I usually have too much, but you should certain add more during the cooking if it appears dry. If yours cooked faster, and seems done, it should be removed from the oven when everything is well-cooked together. The cassoulet doesn’t get covered while cooking.